I'm always complaining how BFC is dead so I'm doing my part... for the 10 of you that still read this board. You can find the previous couple chapters of my builds on here. All with the same car. 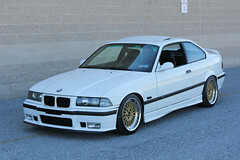 I could find them for you guys but apparently all of google has stopped indexing old bimmerforums posts.. In continuing style I'll list where I was at and what I'm doing now. I'm doing this in part to be able to remember. We planned to do this guy over the long weekend.. as is the normal now no time for my own cars.. We started tearing the car down Friday and it would be back together today but our ARP Nuts are held up in Wyoming, so tomorrow it will be back together. Last edited by vollosso; 01-26-2019 at 11:12 PM. ]What will displacement and compression ratio be in new motor? Last edited by rajicase; 01-21-2019 at 03:30 PM. Looking forward to seeing some pictures. Do you have any good sound clips of your exhaust by chance? What happened to the87mm bore motor? We’re kind of in the middle of going through it. At this time we are of the belief that we lifted the head, hydro locked the cylinder which blew the cylinder walls out on both sides, then it looks like the piston grabbed the wall and stretched the rod in half. I’m talking with the component manufacturers now trying to work through it, I’ll post pictures eventually. 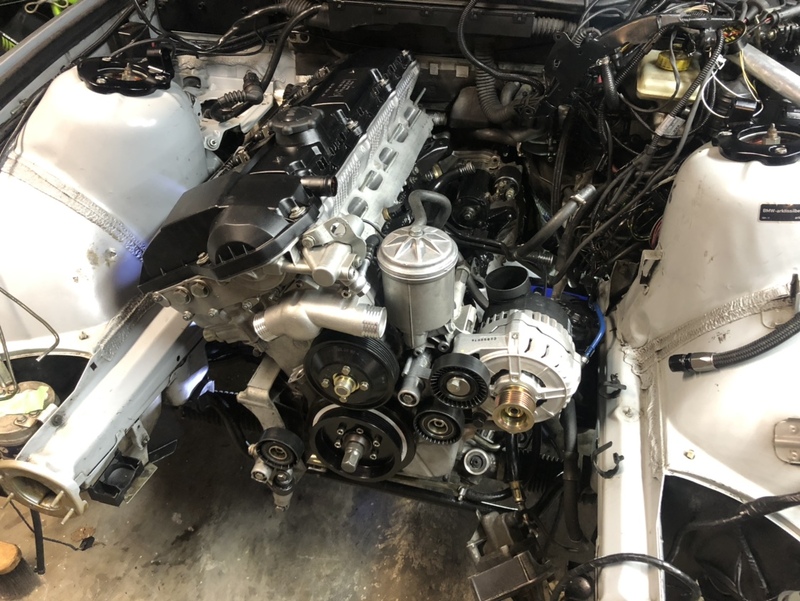 Trying to drop this motor in tonight! Curious to see these!! I might need a set. New old stock Burke’s . I actually think they are 8.8:1 now that I'm not in the garage. The brackets will be nice stainless, 20 ga, CNC bent. With an AC line kit they will fit easily a 4.5" intercooler or without the ac line kit easily 3.5". Probably could push both of those 0.5" wider if you really got into the crash bar. Last edited by vollosso; 01-23-2019 at 12:19 PM. This is good, excited tovsee what she does all turnt up. Woo lets see it eat! I’m hoping it’ll get towards 1200whp but we might be out of turbo. I’m just excited to run it again. Kenton tried with his S54 to break 1000rwhp, but had a really hard time above 26 PSI. It seemed like the engine got to a point where it took more power to drive the turbo, than the airflow off the edge of the map was able to provide back into the engine. Backpressure went up pretty fast above 26 PSI manifold pressure. The only thing I can think of to help the situation would be to run an even bigger turbine housing....or maybe look at the new G42 Turbo from Garrett. I am of course assuming you are using the 6870 which the "cover" is listed on your hardware. If you are using a different turbo...I'm clogging up your thread! Shoot I missed your replies! Yes, I’m using a 6870 hp-cover with 1.15ar t4 divided exhaust. I haven’t seen anyone push this housing and a proper manifold. Lots of 0.8x opens and a few 1.0 divided. Both similar in volume really. It has a nice 4” inlet, proper filter, good manifold. It’ll definitely crack 1000whp. It did 996whp at 5500 last time. I was looking at the g42 for similar reasons, but this is it for me. 6870 is more than enough turbo. —- onto a few updates. Sorry this is pretty sparse but we are so limited on time right now. So we finally got the proper nuts from arp on Thursday. Assembled the motor that night. Takes a while when you’re fully disassembling everything and cleaning it. 125ftlbs on the head studs! Yesterday we finished the assembly, made up some new feed and drain lines, attached the trans (boy is the gs6 a monster), and installed it! 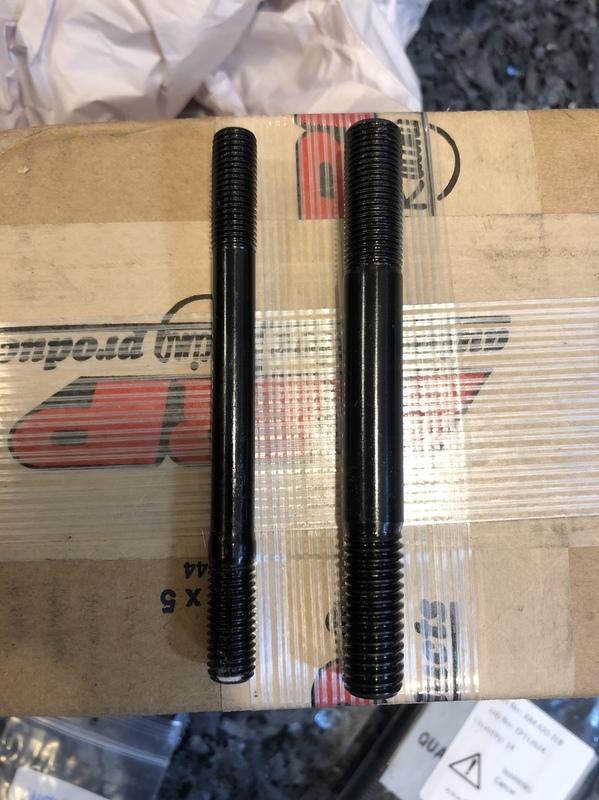 Ran into a few issues, we grabbed a new Bosch 140, and it was the rear nut Type, instead of being threaded, and I cut up two bolts and welded them together, quickly. 30 minutes later the head shot off and across the shop! Ground and rewelded it with more penetration and did the same thing!!! Wild. Going to have to grab a few bolts and a plug for the head today. Going to work up a new m50 manifold, clean up some of the vacuum routing. The car has been revised so many times they need to be cleaned up. Got a new tstat, housing and hoses. This is really the most cleaned up the car has been! I did get the custom Ac lines back.You guys won’t believe how expensive they were.... but it’s done and we can finally remove those awful oem lines. And finally I’m updating my boost reference lines, they were 1/8” hardlines and I really feel it was hurting my low boost threshold. I could regulate down to 21/22psi. I was running two gates off a single 1/8” line. Going with some new 1/4” aluminum tube. wow.. big project !! wish I had the guts to build something like that ! This might sound like an odd question, but how are you clearanc'ing the head gasket for the larger head studs. When I went from 10mm to 11mm studs, I had a really hard time with fitting the head gasket over the studs...a 12.7mm stud is going to need a big hole. Secondly, are you completely removing the alignment dowels on the head? I cut a set of custom dowels. I used a sharp drillbit. It didn’t go great. Got the job done but I had to do a ton of post work. I'm glad you're keeping the forums alive. Better than Facebook groups in my opinion. So for 1/2 head studs you also have to drill the head stud holes bigger right? Do you have to machine custom washers as well? The 1/2” arp washers fit. Barely. There are a few more things we have to machine. The head stud holes all need to be clearanced for the stud. There are a couple stud holes that need extra clearance for oil passage to the cams. And finally the two dowels need to be cut. I did all of this manually myself. Quite stressful. So it's a challenge then! But for the cut ring, my friend machined me a punch of sorts. It just has the single layer of tin and strikes through pretty well. But I'll probably just use the clamp method if I have to get another cutring.